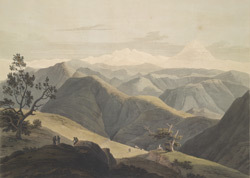 Plate 21 from the fourth set of Thomas and William Daniell's 'Oriental Scenery', which they called 'Twenty-four Landscapes'. The views progress northwards from the far south at Cape Comorin to Srinagar in Garhwal in the Himalayan mountains. As they reached the highest point on the route from the plains for Srinagar in Garhwal, the Daniells were extremely impressed by '...the appearance of a prodigious range of still more distant mountains, proudly rising above all that we have hitherto considered as most grand and magnificent, and which, clothed in a robe of everlasting snow, seem by their etherial hue to belong to a region elevated into the clouds, and partaking of their nature; having nothing in common with terrestrial forms. It would be in vain to attempt, by any description, to convey an idea of these sublime effects, which perhaps even the finest art can but faintly imitate'. The view is dominated by the icy slopes of Nanda Devi.